Burt's Bees is easily one of the most popular natural based beauty brands out there, with products ranging from skincare to haircare and a dabble in colour "makeup" (I use the term loosely) they have grown quite a following. One of their best selling products is their natural lip balm and although I've seen it in the purse of every single girl friend of mine, I loved my Carmex too much to notice. 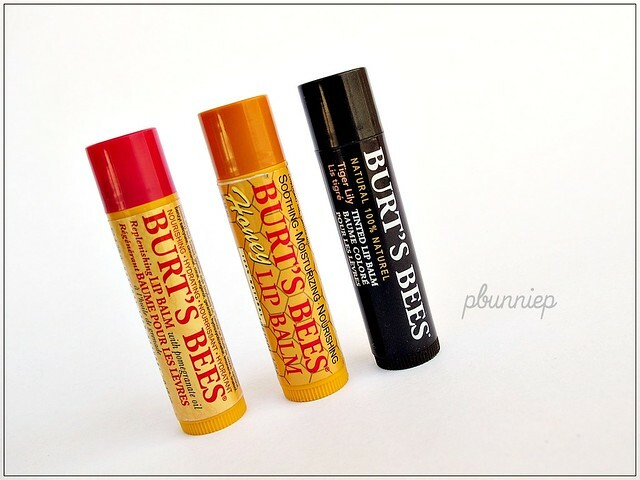 Rewind a few months back and I suddenly find myself with 5 Burt's Bee's products on my shelf...including three of their famous lip balms. What a great chance to do a review I thought! One thing you'll notice immediately when you encounter Burt's Bees product is their focus on natural and sustainable products. This means using as any natural ingredients as possible (yes you can read the ingredients list), saying no to animal testing (happy bunnies) and using recyclable or post-consumer materials (good karma). In fact all three lip balms I have to share today are marked 100% natural. Their brand aesthetic is simplistic and you can spy their happy yellow packing from far down the skincare aisle. Texture: Waxy balm, satin look. Recommended for: Extremely chapped lips, night treatment. Thoughts: Oh my honey! This balm is sweet, literally. The first thing that caught my attention was the incredibly strong aroma of honey beeswax/honey comb. It is marked as a "soothing, moisturizing and nourishing" product and I would say that in performance it delivers on all three promises. I normally steer clear of beeswax balms because I'm not a fan of the slightly matte/tacky feel of beeswax so I generally run for the oil based products. 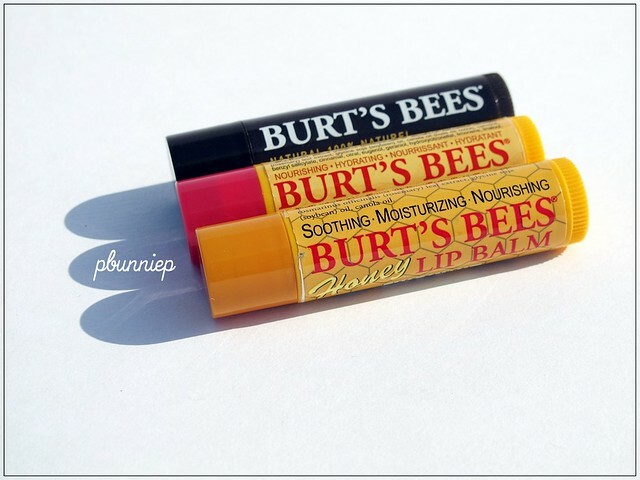 Surprisingly, the Burt's Bees balms (yes all three of them) has a great balanced textured between wax and oil so that they apply smoothly on the lips without being too greasy or too matte. It's something that is intensive enough for very dry lips as a daily treatment and for everyone else, this is a good product to use right before bedtime to condition your lips while you sleep. The only downside for me was the scent as it was just too overwhelmingly fragrant and it will likely just remain on my nightstand. It wears off evenly, doesn't leave any strange residue on the lips and leave lips in tip top shape. Ingredients: Beeswax, sunflower seed oil, coconut oil, lanolin, flavour, honey, tocopherol, rosmary leaf extract, soybean oil, canola oil. Scent: Slightly sweet, berry scent. Texture: Waxy balm/oil, moist look on lips. 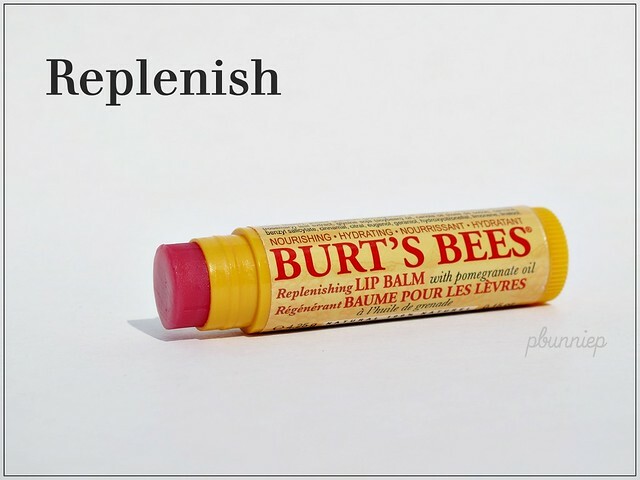 Recommended for: Everyday lip balm, for dry to normal skin/lips. Thoughts: Slightly less intensive than the honey balm, the pomegranate oil lip balm would be great as an everyday lip care product. It has a lighter consistency and feeling on the lips, less wax but more oil it seems. Although tinted pink with carmine, the balm is virtually colourless but it does provide a very moist sheen on the lips which is very naturally pretty. I found it also plumped up lip lines and just made my lips look smoother overall. 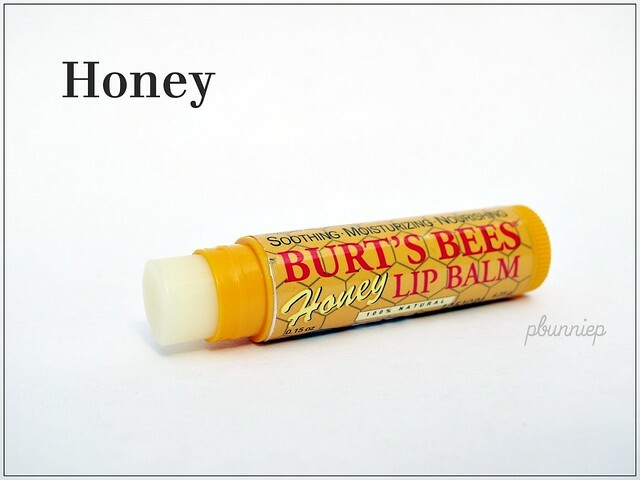 Although the ingredients list is slightly longer, it does contain many of the same basic components as the honey balm. For those looking for a lighter texture and everyday nourishment, the pomegranate oil balm is easy to love. Ingredients: Sunflower seed oil, beeswax, coconut oil, castor seed oil, lanolin, flavour, pomegranate oil, tocopherol, rosemary leaf extract, soybean oil, canola, carmine, benzyl salicylate, cinnamal, citral, eugenol, geraniol, hydroxycitronellal, limonene, linalool. Scent: Almost none, but ever so slightly like waxy lipstick. Texture: Waxy balm, soft shine on the lips. Recommended for: Daily balm with a little something extra. Thoughts: I don't think it would be an understatement to say that I had high expectations for this product when I received it in my Glymmbox one month. Packaged in a large cardboard tube, it looked fancy and demanded attention. And given the $8 dollar price tag, it must be one of the most expensive lip balm products in the drugstore. 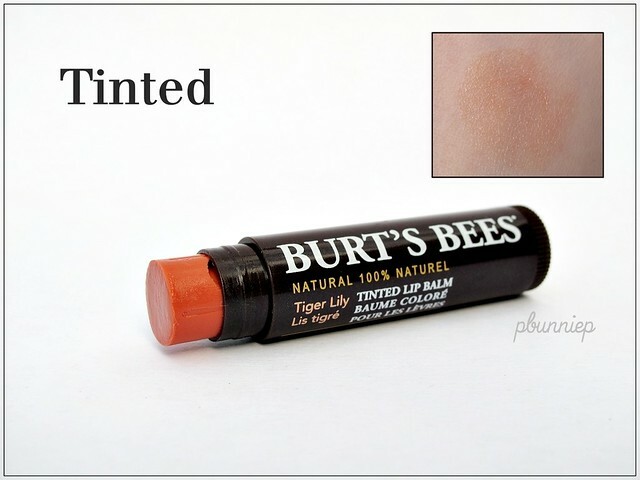 The texture of this tinted balm is very similar to the honey version and although it contains many oils the effect on the lips is not overly glossy. The sheer colour tinted my lips with a little rosy colour and to my surprise had good staying power. Coupled with moisturizing shea butter, olive and coconut oil, this tinted balm is something I would keep in my gym bag for a little bit of pretty on the go. The only downside would be the slightly lingering waxy lipstick smell which seemed out of place when compared to the two previous products. Overall, I would say that all three of these Burt's Bees lip balms are solid performers though each has their strong point. My favourite would be the pomegranate, followed by the tinted balm and then the honey balm. They are simple, easy to use and easy on the environment while still providing excellent results and looks very natural on the lips, excellent for those who like to play it coy *wink-wink. Would I give up my Carmex for this? Likely not because I still prefer an oil based product and my Carmex is more economical so I won't feel terrible if I misplace one. Yet I would always be happy to carry a little Burt's Bees in my pocket. A little extra something to bring a smile to your face, this is such a cheery commercial! Make my lips want to smile. They have nice ingredients, I would definitely try out the honey and the tinted ones if I had the chance! I'm just like you, I've been using Blistex for so long I fail to even pay attention to anything else despite the fact that every single person has Burts Bees in their bag. Thanks for all this info, maybe I'll finally give it a try. I'm using the Carmex right now and it kind of stings my lips so I might give Burt's Bee a try after I finish this one. Thanks for the review!